I have a love hate relationship with stir fries. The boys love them which means I should do them way more often than I do. I guess I find they always end up tasting the same. This is based on a Weight Watchers recipe I got in the ‘so you’re breastfeeding’ brochure. The hint of sweet chilli and the fish sauce give it a great flavour – very much on par with what you’d get in a Thai takeaway, only better. Toss the beans into the wok (I added a dash of water to aid their cooking and the fact I wasn’t using anymore oil) and cook for about two minutes. Now, for those fellow WWs, this was a 10point dinner (the bonus of breastfeeding, you get more points) but I couldn’t eat the whole serve (go figure). * For some inexplicable reason Woollies didn’t have green beans today and I didn’t have time to get to my favourite fruit and veg shop at Terrey Hills so I used McCain frozen baby beans – they worked a treat. Chef was only working dinner tonight, so we had another day together. After reading this review, we headed into the city for a feed at Two Good Eggs (on Goulburn Street in Sydney). Another round of deliciously gooey poached eggs on spongey sourdough with a decent hot chocolate. Then we scooted over the Balmain to Belle Fleur for some divine hand made chocolates. My current obsession is its lemon meringue, although today I sampled its Creme Caramel and it gave the lemon a decent run for its money. Then we picked up a new cot mattress on the way home, which was too big (even though I reassured Chef and the shop assistant that no, it was the right size) and I had a snooze before picking the boys up from school and Jasper from daycare. Then tonight, another sensational dinner with a thank you to Nigella once more. I’ve added some garlic to the marinade ingredients and used tenderloins whereas Nigella uses chicken breast she’s bashed flat and cut into strips, but that’s about it. In her book Feast, she says to panfry them, but on the TV series she oven bakes them. I did the oven bake version because quite frankly, I hate pan-frying anything – not for the taste, but for the cleaning afterwards. combine all the marinade ingredients in a large snaplock bag. I served them with chips (frozen variety, that cooked on another tray at the same time as the chicken) and peas. Oh, and I’m still pregnant and significantly uncomfortable. I saw her make this and was intrigued. Intrigued enough to cook it, and MY GOODNESS was it seriously delicious. bake for 1hr 15mins, turning everything occasionally so it all browns evenly. Bring the milk and cream to the boil with the onion, nutmeg and bay leaves, turn off the heat, put a lid on and let the onion infuse the milk. Peel the potatoes and slice 1cm thick – I use a mandolin for this as it turns a painful, time consuming job into something relatively painless. Put the potatoes into the milk mixture and bring it back to the boil. Reduce to a simmer and cook until the potatoes are soft but not falling apart. Grease a large baking dish (about 30x37cm) and as you transfer the potatoes remove the onion and cloves and the bay leaves. Pour over the milk mixture and then bake for about 15 minutes or until its all golden and bubbling. Seriously one of my most favourite dishes of all time. I have never ever been one for the cooked lettuce concept, but this, this has changed my world. Cook the onion in the butter until soft, then add the lettuce and cook until it has wilted. Add the peas and stock and cook over a robust simmer until the stock has reduced slightly and everything is tender. For dessert I did my Chocolate Sludge, but it was weird and didn’t go sludgy at all. I think it’s because it was cooked and we didn’t eat it for a while, so the sauce component sort of got absorbed into the cakey top. As there was enough of everything to feed the whole family again on Tuesday night, I made a new dessert – Nigella’s Chocohotopots. cook for 20 minutes – the tops go all cracked and lovely and inside is just this gooey goodness. I mean how easy is that? And can I just say, they are a.m.a.z.i.n.g. – and that’s from someone who really doesn’t do chocolate. There’s much fuss about quick dinners these days. You can start this and have it on the table in under 30 minutes, EASILY. I promise. I’ve been making it for more than seven years about once a fortnight but never less than once a month. I guess it’s this family’s spag bol. 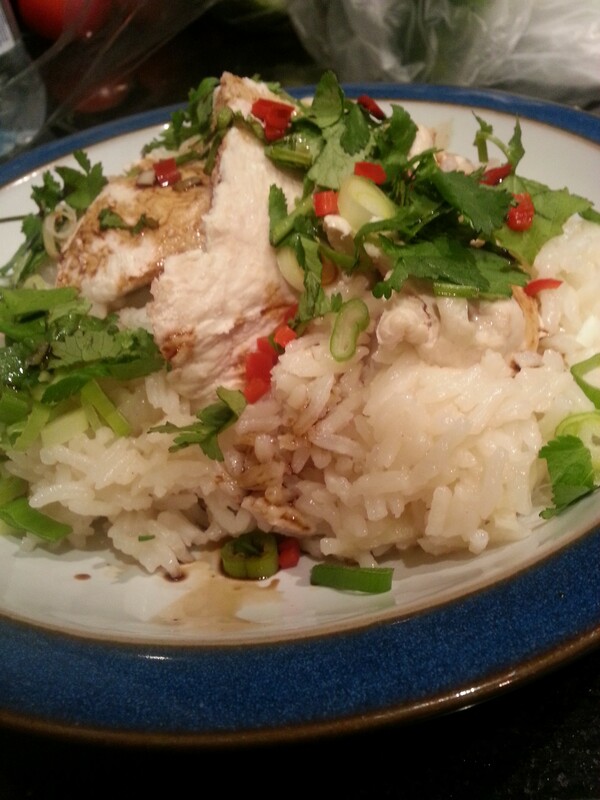 The only thing that has changed since I started making this is I now tend to use chicken tenderloins rather than faffing around with chicken breasts and my ginger shallot sauce is a compulsory accompaniment (also now added to recipe below). Sesame ginger chicken and rice for #everyfuckingnight with ginger shallot sauce. A fabulous quick and easy, one pot dinner. Cover again and simmer for a further 7-8 minutes or until rice is just tender and chicken is cooked through. Remove from heat and set aside with lid on for a further 5 minutes. Serve topped with sliced shallots, chilli and drizzle with soy sauce. 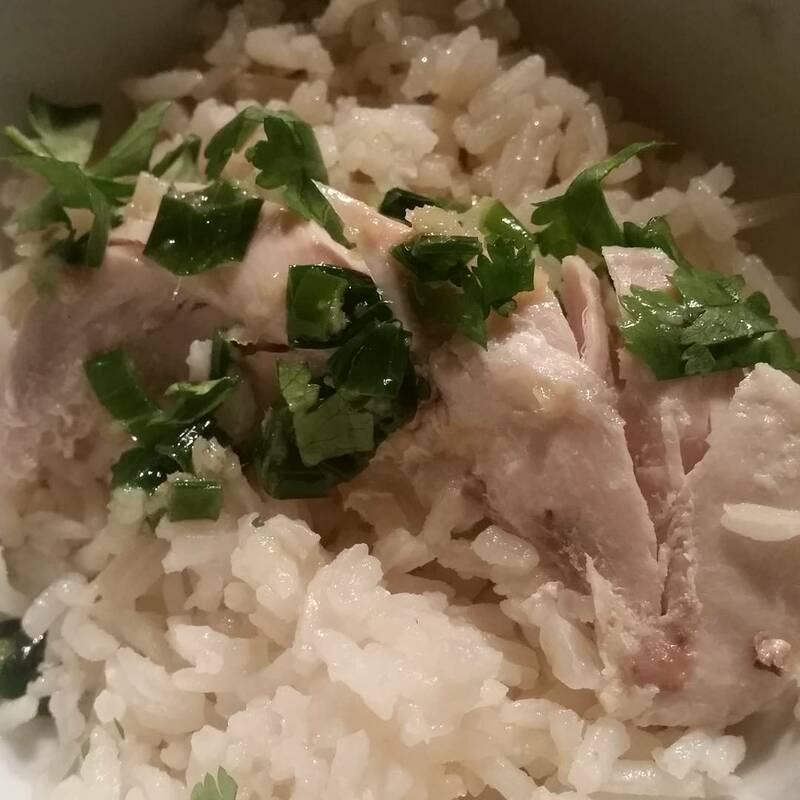 Incredibly simple, outrageously tasty white cut chicken recipe with the compulsory ginger and shallot sauce. The first Hainanese style chicken recipe I ever made and I still basically follow these principles. To take it to the next level, use the poaching liquid to cook the rice in. Place the chicken in a pot just large enough to hold it snugly and cover with cold water.